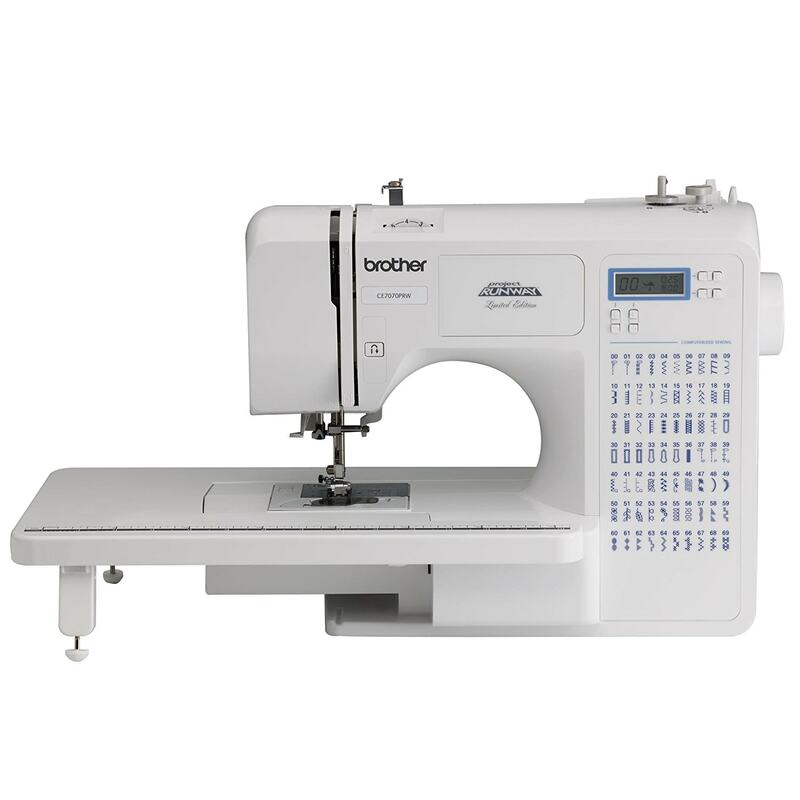 Brother Project Runway CE7070PRW is coming from the world’s premier producers of sewing machines, Brother International Corporation. This is one of the project runway models that would offer you with a way to become a fashionista at a greater value. This machine is designed in such a way to make your sewing process easy and fun. In addition, the results that you are going to get out of this model will be professional. This model comes to your hands with features that are typically found in more expensive sewing machines. The current project runway model has been designed to deliver couture-level and stitch quality. With the larger number of in-built stitches than many other sewing machines like Brother Project Runway CS5055PRW, this model is computerized and easy to use. This is the most versatile sewing machine coming with the larger sewing machine and a wide table which makes this model ideal for larger projects. With the weight of around 16.4 pounds, this model is most reliable with the loads of convenience factors built into it. This machine would be able to automatically adjust all the nuances of your sewing. With the lasting warranty for 25-years from the manufacturer, this machine would be ever-lasting. Display and Stitch Selection: This Brother sewing machine has been constructed with LCD display screen along with an easy stitch selector. With these options, you can simply choose your desired stitch function and the settings with the pushbuttons. Moreover, you can view your selection displayed on the screen. LED-lit Workplace: The work area provided by this sewing machine will be super bright and is LED-lit. This would allow you to view all the details of your projects and will be perfect for dark fabric sewing. Wider Table: The wide table in this model will provide you with extra space and will be ideal for sewing of prom dresses and formal wear. Automatic Threader: With a touch of a lever, this option would push your thread through the eye of the needle. Elegant Buttonholes: The seven styles of one step buttonholes in this machine are automatically sized in order to fit your specific buttons. This would help you achieving the designer finish. Bobbin Set-up: According to the sewing machine reviews, the quick-set top-load and drop-in bobbin is exclusive and would make sure that your bobbin stays in place. This helps in achieving the reliability and even stitching. Seventy Stitches: This machine has been loaded with computerized 70 in-built stitches which include specialty stitches, sewing on elastic and decorative stitches. In addition to the above mentioned options that are loaded into this machine, there are some other features built into it which are making this model as the great sewing machine of recent times. Markings on Needle plate: The markings that are imprinted on the needle plate would allow you to enjoy sewing in straight lines. In addition, these would allow you to keep your fabrics at the right distance from the needle. Convenient Chart: In the convenient stitch chart that is printed on the front of your machine, you can see all the in-built stitches made available for you to have a glance. Faster Winding: In the current model, the bobbin winding is faster when at the same time, it is reliable and easier. With the upper thread in place and the bobbin set over the winder, you will have to just push the bobbin to the right for getting the bobbin does the work. Feed System is Exceptional: The exceptional feed system in this sewing machine would aid you in moving the fabric smoothly for the purposes of more precisely formed stitches. Drop Feed System: The drop feed system of this machine would allow you to handle all the free motion quilting with much more ease. Pile of Accessories: With the sewing machine set, you are going to a range of accessories to occupy the storage place. Those are: Zigzag Foot, Over-casting Foot, Monogramming Foot, Zipper Foot, Blind Stitch Foot, Buttonhole Foot, Button Fitting Foot, Bobbins, Needle Set, Twin Needle, Cleaning Brush, Screwdriver, Spool Caps, Extra Spool Pin, Seam Ripper, Foot Controller Pedal. Operation Manual: In order to aid to more in operation, this machine would come to you with a bilingual operation manual. You may wonder on how to handle this sewing machine with loads and loads of features to learn. But, getting started with your sewing machine is very easy. This is because, your stitch selection is computerized and easy, and even the buttonholes creation is made easy with a single step operation. In addition, the complete threading system has been designed for easy operation with the features like automatic threader, faster bobbin winding and the quick-set bobbin. You will not find difficulty in operating this sewing machine at anytime. This machine can be used more comfortably for larger projects. The needle plate markings and stitch chart would make it easier to follow the sewing process. This machine is much more durable with up to 25-year limited warranty. The price is affordable, and now you can purchase this computerized model at the 60% discount price by logging onto www.amazon.com. The thread holder is plastic and can break-off or bend when you are not gentle to it. This machine is lacking the feature of automatic tension control and you have to set it automatically. 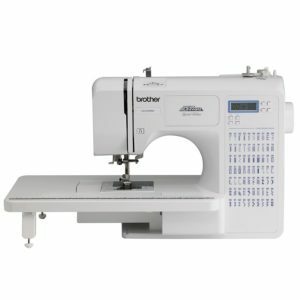 Anyone who uses Brother Project Runway CE7070PRW will appreciate the value added options that are loaded into this sewing machine model for sure. This model will give the options for the newcomers while also enabling the experienced sewers to make gain more practice. Thus, this model is suitable for both the beginners as well as experts.